I asked my mom, Nansie Rice, to write down her memories of my grandpa. I wanted everyone to get a feel for the real person who was behind this collection. This will be available on the “About Grandpa” page as well, but I thought I do a post first so it wasn’t overlooked. Here is the first installment. Keith W. Kinney was born October 29, 1918. Because of the depression, he quit school in about 9th grade and worked at various jobs to help out at home which was in the little town of Davisburg, Michigan. Among other things, he was a substitute rural mail carrier and early on started repairing radios at home. At some point probably in the mid-1930’s, he worked as a house boy for a Mrs. Cora Waterbury. She and her husband also owned two restaurants–the “big” Canteen and the “small” Canteen (located across from each other on Dixie Highway at the corner of Davisburg Road, Springfield Township, Michigan) and she soon hired Keith as a cook and counter man. In 1939, he married my mother, Eleanor Grenier, who also worked at the canteen (as did her two brothers, George and Andy, who actually introduced my parents). Mom and Dad lived in a really little house behind the big Canteen and were still living there when my brother Darrell was born in 1941. All along, Keith continued repairing radios. I can remember from when I was a little girl that his radio workbench was upstairs, under the eaves at my Grandma Kinney’s house. He started taking correspondence courses in radio engineering from Michigan State College and continued working at the Canteen. According to grandma, he would take his books with him and worked on his studies at the Canteen when he wasn’t busy, especially at night. Mom says sometimes he would tinker on radios there too. During this time, he had a regular customer who stopped for coffee almost nightly on his way to and from his job at WJR in Detroit (that was a very long drive in those days). He saw Keith both working hard on his studies and tinkering on radios and so encouraged him to keep studying and talked to him about working in radio. He promised Keith that once he completed his course of study, he would help him apply for a job at WJR. He kept his promise and after Keith completed the correspondence courses, he was hired by WJR in 1943. 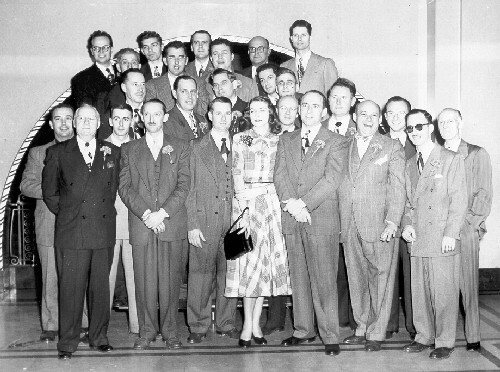 At WJR sometime in the 1940s. Keith is in the back, fourth from the left with the bushy eyebrows. I was born in 1943 while my parents lived in an apartment over the hardware store in Davisburg. Within a couple years we moved to a house on Andersonville Road also right in Davisburg. Many (most) of my early memories of my dad are directly tied to music and the “Big Records” (that’s what we always called them). In my memory, any time dad was at home, the records were being played. I don’t remember anything being played that I didn’t like–just some I liked more than others. I loved the Al Jolson songs–I can still remember the arrangements and most of the words to the many of the songs on the two big records of Jolson music. I can remember dad singing along and dramatizing all the songs–arms outstretched and on one knee singing the finale of “Mammy”! “Rock-a-bye your Baby with a Dixie Melody” was another one we really hammed up. There was a skip on the recording of April Showers and Dad would put his hands to his throat as though choking at that exact moment. I really liked the “hit parade” records and knew all the words to songs like “Together,” “I’ll Be Seeing You,” “I’ll Walk Alone,” “Sentimental Journey,” “Always,” and other wartime sentimental tunes. The big band sounds weren’t my favorite, but I liked them all. We also often listened to pieces that were more classical in sound– “Peter and the Wolf” was a favorite of mine as was “Grand Canyon Suite.” My brother loved Bizet’s “Carmen” and Dad’s very favorite was always “Rhapsody in Blue.” That was high on the favorites list for the rest of us as well. There were also records containing comedy routines, some of which were off-color and placed on a high shelf so my brother and I couldn’t reach them. One recording that we could play was called the “Durante and Moore Opera.” I loved this and for whatever reason memorized the whole routine. I don’t know a lot about it, except that Jimmy Durante and Garry Moore had a radio show–from which this was taken. Dad had written “Durante and Moore Opera” on the record, but I don’t know if that was a regular segment on the show or if that title refers to this one routine. Bits and pieces have stayed with me all through the years. Other fun records were ones that contained popular songs like “Marezey Doats” and “Chickery Chick,” and other records specifically with children stories–Uncle Remus, Jack and the Beanstalk (narrated by the “Great Gildersleeve”) among others. The Christmas records were very special. Every Christmas morning when we were little, we would wake up mom and dad, and then have to wait until we heard “All around the Christmas Tree” playing on the record player. As a teenager in the late 1950’s I remember realizing that in addition to loving the popular music of my day I was totally tuned into and loved the music of generations before. As a very little girl, I remember dancing with dad at first with my feet on top of his in our living room in Davisburg. As I got older, he taught me the “box step” and we would do that and whatever else he wanted to try. He loved Fred Astaire and often imitated his twirls and dips (especially after a few drinks). I remember dad rolling up the living room rug and sprinkling corn meal (? ?I think that’s what it was) on the hardwood floor so we could slide and glide better. Posted in History | Comments Off on Who was “Grandpa,” anyway?